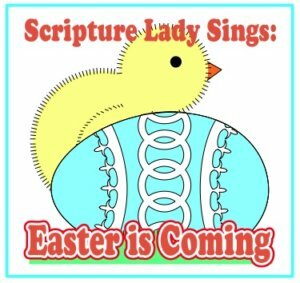 “Easter is Coming” is a Bible holiday song to help your children learn that Easter is not about bunnies or eggs or a brand new dress or suit. Easter is about how Jesus gave His life upon the cross to save us from our sin. Easter is about God’s great love for you and me. It’s almost Easter! Spring has arrived and so has the holiday that celebrates that Jesus is ALIVE! Try singing this new Bible holiday song for Easter to help your kids know the true meaning of Easter. I wrote this Bible holiday song for Easter last year and it has quickly become one of my favorites to sing to kids. Easter is coming! Easter is coming! I’m so excited for Easter! Easter is coming! Easter is coming! I’m so excited for that day! It’s not about bunnies. It’s not about eggs. It’s not about basketfuls of candy. It’s all about Jesus and the love that He gave when He rose from the grave! Looking for a fun way to share the resurrection of Jesus with your elementary kids? 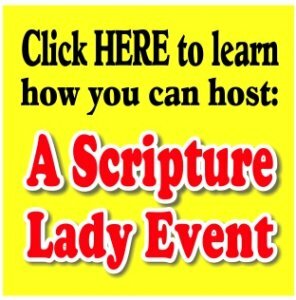 If you liked this Creative Bible idea about a Bible song for Romans 3:23, then sign up to receive Scripture Lady’s Free Email Kid Tips packed full with creative ideas and receive 12 FREE Bible downloadable resources to help get the kids you minister to excited about the Bible! Just go to www.MyFreeBibleGames.com to fully subscribe.